On August 15, 1865 Mikao Usui was born in Taniai, Japan. He practiced Kiko which consists of breathing exercises, meditation, and movement similar to Qi Gong. It is described as a ‘moving meditation’. He studied religion, psychology, medicine and spiritual development. 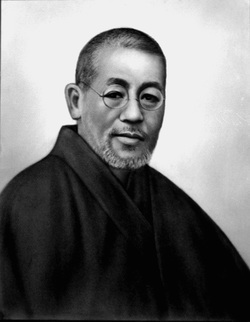 Mikao Usui became secretary to Shinpei Goto (the head of the Health and Welfare Department who went on to become the Mayor of Tokyo) and was a member of the metaphysical group called Rei Jyutu Ka. In 1914, at the age of 49, he decided to become a Buddhist Monk. In 1922, he went on a 21-day retreat of meditation, prayers, chanting and fasting at Mount Kurama in Kyoto, Japan. While standing under a waterfall, he did a meditation designed to open and purify the Crown Chakra. During this meditation he had a spiritual awakening on the final day of his retreat. A powerful light entered the top of his head, expanding his awareness and he realized a great power had entered him. He intuitively knew he could now heal others without depleting his own energy, as he had when he practiced Kiko. Mikao Usui moved, with his wife and children, to Tokyo in April 1922. On the basis of his lifelong spiritual journey and his more recent spiritual experience, he developed “The Usui System of Natural Healing”. He then started a healing society named "Usui Reiki Ryoho Gakkai". Shortly afterward, he opened a clinic in Harajuku and began doing Reiki sessions and teaching classes.